It's finally time to ditch that old i5-2500K. Even with a locked multiplier, the i5-8400 delivers awesome performance, for under $200. I've been hearing complaints about Core i5 'only' having four CPU cores ever since Ryzen 5 came to market, and for good reason. If you're just playing games, the chips are good and have arguably been the best value Intel processors, but do something more complex than gaming (like livestreaming or CPU-based video encoding) and a 4-core/4-thread (4C4T) chip can really start to bog down. With AMD offering 6C12T Ryzen 5 parts for around $200, Core i5 has become increasingly difficult to recommend. Intel's solution to this problem is now here, thanks to its 8th Gen Core i5 processors (aka, Coffee Lake or CFL). I covered more of the details of the Coffee Lake launch in the Core i7-8700K review, but this is the biggest generational improvement in Intel's mainstream CPU line since the mainstream/enthusiast split that occurred with the 1st Gen Core i7 in 2010. Core i7 and Core i5 both get 50 percent more cores/threads, without a drop in clockspeeds, and Core i3 basically takes the previous generation Core i5's place as a 4C4T part. If you're still running a 2nd or 3rd—or even 4th—Gen Core processor, it's finally time to upgrade. And just like AMD's Ryzen 5, Intel has a compelling Core i5 model available for under $200, the i5-8400. It's telling that Intel didn't even feel the need to send out the unlocked Core i5-8600K this round. That chip would require an aftermarket cooling solution, bringing the total price closer to $300. The i5-8400 meanwhile includes an Intel cooler and fan for $190. That's a great start, but what about clockspeeds? If you look back at Kaby Lake's i5-7400, the maximum turbo clock was a tame 3.5GHz, with $20 more getting the i5-7500 and a 3.8GHz turbo. The i5-8400 has an impressively high 4.0GHz turbo, but the base clock of 2.8GHz might scare some away. Rest easy, as the CPU will actually run at 4.0GHz on one core, 3.9GHz with 2-4 cores loaded, and 3.8GHz with all six cores loaded to capacity—and though it might exceed the nominal 65W TDP, it didn't get overly hot. That means in addition to 50 percent more cores relative to Kaby Lake, you also get the same or higher clockspeeds. There are a few things you'll need to know before running out and buying a Core i5-8400. First, Intel is serious about locking down the clockspeed. I tried adjusting the BCLCK in the BIOS to see if I couldn't squeeze a few more percent out of the chip. Nope—nada! Any setting other than 'auto' or 100MHz failed to POST. But you're not completely blocked from improving performance, as you can raise the uncore clock from the default 2.8GHz to 4.0GHz and it did appear to improve performance a few percent. But if you want an unlocked Intel, the K-series (or X-series) parts are the only way to get that. The other major issue a lot of people will have is that Coffee Lake processors require a new motherboard and a 300-series chipset. Right now, that means Z370, which is the only current chipset (though others are coming). That Z270 motherboard you purchased earlier this year? Yeah, tough luck—despite earlier rumors that Coffee Lake would work in existing motherboards, that didn't actually pan out. What's more, you can't bring your existing Skylake or Kaby Lake chip along and put it in a Z370 board. This is due to modified power requirements on Coffee Lake—and let's be clear, the pin-outs on the Coffee Lake and Kaby Lake processors are different, to the point that if you place a KBL chip in a Z370 board, or a CFL chip in a Z270 board, you could actually fry the chip. (I'm not planning on trying it, needless to say.) But the real question is whether Intel actually needed to modify the pinouts in the first place. I suspect not, and keeping the same socket while changing the pinouts seems like a very bad idea regardless. The net result is that if you want a Coffee Lake processor, you'll also need a new motherboard. As for the Z370 chipset, in terms of features and functionality it appears to be identical to Z270—just with some updated microcode that only recognizes Coffee Lake processors. There are no extra PCIe lanes, USB ports, or anything else that I could see. It's a bit sad to see Z270 and Kaby Lake come and go so quickly. Obviously, they're not completely obsolete just because something new exists, but these were good CPUs and good motherboards. The Z170 launch back with Skylake in 2015 was a bit rocky, and by comparison Z270 was smooth sailing. Now, all of those designs need to be scuttled, to be replaced by Z370 chipsets probably sitting in otherwise nearly identical designs. RIP, Z270…. The full list of test platforms and hardware is up and to the right, but the only real change we've made for Coffee Lake is to swap our Z270 board out for a Z370 model. Gigabyte sent its Aorus Z370 Gaming 7 motherboard, an attractive high-end design with premium audio and three M.2 slots for NVMe storage. For testing, I used the F4a BIOS revision. All test systems also use fast DDR4-3200 memory to provide optimal performance, with M.2 NVMe SSD storage for the OS and applications, and games stored on a large 2TB SATA SSD as a secondary drive. Nvidia's GeForce GTX 1080 Ti Founders Edition graphics card was selected to help differentiate the CPUs in gaming benchmarks, with a chosen test resolution of 1920x1080 at ultra/maximum quality settings. The resolution allows for faster CPUs to make a difference, as higher resolutions will move the bottleneck to the graphics card, and even at 1080p ultra some games still end up GPU limited. If you think testing at 4K instead of 1080p would be better, just look at the performance charts for The Witcher 3 and try to decide which CPU is 'best' for gaming. Finally, a quick word on the charts. You'll notice a 'i5-8400 OC' entry in the graphs … but isn't this chip multiplier locked? Yes it is, but you still have the option to tweak the uncore clockspeed a bit. By default it's set to 2.8GHz, and I had no trouble running it at 4.0GHz. I also played around with CPU multipliers to see if I could force the CPU to always run at 4.0GHz, but at least on the Gigabyte board that didn't appear to work. Still, bumping up the uncore clock does help a bit, and that's what the 'OC' entries represent. Take your existing Core i5 processors and add 50 percent more cores, and what does that give you? For games that already hit maximum performance on an i5-7600K (as an example), it won't do much, but there are an increasing number of games that will show small to moderate gains with more cores and/or threads. Generally speaking, Hyper-Threading on an Intel CPU core gives you about a 20-30 percent boost in potential throughput, so having six full cores running six threads is actually going to be faster than four cores and eight threads—at least at the same clockspeed. Since the i5-8400 is clocked a bit lower than the i7-7700K, it's not quite a direct replacement, but as you'll see in the benchmarks, there are numerous games where the newcomer i5 beats the previous generation i7. In the overall average gaming performance metric, the 'budget' Coffee Lake i5-8400 ends up beating the former champion i7-7700K. Digging into the individual tests shows how this happens. There are only two games where the i5-8400 doesn't deliver equal or better performance than a (stock) i7-7700K: Far Cry Primal (a four percent deficit) and Dawn of War 3 (a larger 13 percent deficit). Everything else is either tied or slightly favors the i5-8400. Dishonored 2 is the biggest win, with an 11 percent lead, followed by Battlefield 1 with an eight percent improvement. Civilization VI and Hitman show a small four percent lead, and that gives the overall one percent lead—effectively a tie, but at half the price (after you add a cooler) that's still great news. Minimum framerates are a bit more erratic, though again the i5-8400 ekes out a one percent average lead. But this is multiplier locked, which means you won't really get much more performance than what I've shown. What if you compare the i5-8400 against an overclocked i5-7600K, or an overclocked i7-7700K? No surprise, it flips the picture, with the i7-7700K running at 4.9GHz getting a marginal one percent victory instead of a loss—Dawn of War 3 remains the only major difference, though. The overclocked i5-7600K on the other hand still falls short of the stock i5-8400, with the Coffee Lake i5 holding an overall lead of four percent. If you're wondering about AMD's Ryzen chips, even the fastest option, the Ryzen 7 1800X, trails the i5-8400 by a bit more than 10 percent—and overclocking the 1800X doesn't change that much, since it's already running near maximum performance. Practically speaking, most gamers wouldn't notice any difference between any of the various Core i5 and Core i7 processors for gaming purposes, even with a GTX 1080 Ti. And if you're playing games at 1440p or 4K—or running a lesser GPU like a GTX 1070—the differences really start to disappear. With a more modest GPU and/or a higher resolution, the 6-core Ryzen 5 and 8-core Ryzen 7 are also right in the mix with Core i5/i7. They're rarely if ever faster in games, but most of the time the difference isn't going to be felt so much as imagined. What about for non-gaming purposes—how does the i5 Coffee Lake fare in CPU intensive workloads? Clockspeeds start to play a bigger role in multi-threaded applications, but we're still talking about a 50 percent increase in core count relative to the previous generation. Looking at the i7-7700K, it will run eight threads at 4.2GHz (stock), which is about 10 percent higher clocks than the i5-8400. But two full cores versus four extra threads largely negates that difference, resulting in another photo finish. This time the newcomer i5 falls just behind the i7-7700K, but it's mostly thanks to the influence of a few tests where the i7's higher clockspeed comes into play. The i5-8400 falls behind in Cinebench 1T by 16 percent, and four percent in the Cinebench nT test. Video encoding is a tie, with a slight lead for the i5-8400 in x264's more demanding 2nd pass. VeraCrypt also favors the i5, while 7-zip did better on the i7 (though I admit the 7-zip numbers are more theoretical than practical). Looking at other comparisons, the i5-8400 also falls behind the Ryzen 7 processors in most tests, as well as falling slightly behind the Ryzen 5 1600X. The Ryzen 5 1600 is the inflection point (at least at stock), with the i5-8400 taking back the overall lead, and by the time we get to the 4C8T Ryzen 5 parts the i5-8400 leads in every test. Applications with AVX support definitely favor Intel (x265 and y-cruncher), though the number of applications with heavy AVX optimizations is relatively small. In terms of pricing, the most direct competition is AMD's Ryzen 5 1500X ($179 compared to $187 for the Core i5-8400), while the Ryzen 5 1600 sits a bit higher up the ladder at $210. It's worth pointing out that all of these processors include a cooler, though motherboard pricing generally favors AMD with its B350 boards—X370 AM4 boards end up being very similar in price to the Z370 boards. Prior to the Core i5-8400 launch, what's important to realize is that AMD was winning in general application performance by a landslide. Even using the more expensive i5-7600K (about $250 once you factor in a basic cooler), every Ryzen CPU from the R5 1600 up beats the i5-7600K. By adding two more cores, Intel becomes far more competitive in the mainstream CPU market again. Prior to Coffee Lake, Intel's Core i5 processors were always a bit of a compromise. You had to give up some multi-threaded performance, but you could often make up for it with higher clockspeeds—at least if you bought the unlocked K-series chip. That's still true to an extent—there's no Hyper-Threading on Core i5 even now—but by finally moving beyond quad-core Intel makes up for many of the i5's shortcomings. 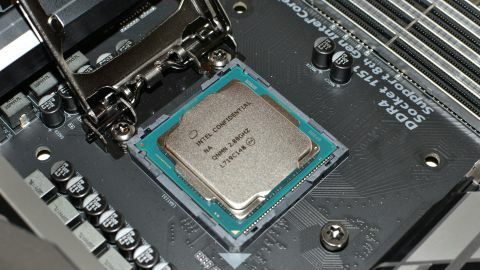 Relative to the previous generation i7-7700K, the i5-8400 offers nearly identical performance. It's a bit faster in gaming tests, a bit slower in overall application performance, but most importantly, it costs about half as much (after you add in a cooler on the 7700K). As good as the i5-8400 is, the unlocked Core i5-8600K is potentially even better. It has higher stock clocks (4.3GHz vs. 4.0GHz), and those who have tested it report hitting 4.8GHz, and sometimes 4.9-5.0GHz, on all six cores. But to get there, you'll need a good cooling solution, which means the total price is closer to $300. For only $12 more you can buy the Core i7-8700, which gives you higher stock clocks of 4.3-4.6GHz plus an extra six threads. Given the choice between an overclocked i5-8600K and a stock i7-8700, in this case I'm going to point to the Core i7 as the better recommendation for nearly all users. Looking at the big picture, there are now three primary candidates in the $200 CPU market: Core i5-8400, Ryzen 5 1600, and Ryzen 5 1500X. For gaming purposes, Core i5-8400 is definitely the way to go, delivering 25-35 percent better performance than the Ryzen 5 parts. But that's with a high-end graphics card, so if you're going with a mainstream GPU the gap will be much smaller. In application performance, Intel also comes out ahead of both Ryzen 5 parts, something that wasn't at all true of the previous i5-7400/i5-7500 offerings. That makes the Core i5-8400 the best overall processor in the mainstream market. It's just a damn shame you don't even have the option of upgrading an existing Z270 system with the Coffee Lake parts, but it's still an excellent value and well worth considering. Intel is more generous this round in both core counts and clockspeeds, mostly because it had to be in order to come out on top. With renewed competition from AMD in the CPU market, we can only hope that 2018 will continue to give us more dramatic improvements in CPU performance, at a price that won't make us flinch.